On Sunday I, and a group of Aro gTér Lineage practitioners, visited Lam Rim Buddhist Centre, near Raglan, South Wales. I worked out that it had been more than 30 years since we had last visited. 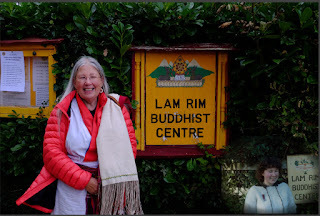 Lam Rim was where my journey as a Buddhist began, and it was wonderful to return as an ordained practitioner. ’ö-Dzin took a photo of me at the driveway sign for Lam Rim in 1981, and again on Sunday. He has combined them in the image above. 1981 to 2018. I found it very moving to sit and meditate in the shrine room at Lam Rim. So many memories of happy times flooded back. It also reminded me of being in Bhutan and experiencing the power of a shrine room that has been a place of practice for a long time. Lam Rim is a Gélug Buddhist Centre, and we parted ways when I committed to the Nyingma School of Tibetan Buddhism, and to my root teacher Ngak’chang Rinpoche. This was absolutely the right move for me, as I could follow my aspiration to be a totally committed ordained practitioner, but without having to become a nun. I didn’t want to become a nun. There is no lineage of ordained, non-monastic practitioners in the Gélug School. ‘Householder’ lineages (gö kar chang lö) exist in the Kagyu and Sakya traditions as well, but are most evident in the Nyingma. It is wonderful to be invited back to Lam Rim after all these years. It was a joyful and inspiring day. Teachers of many traditions taught there in its early years, and I in fact met Ngak’chang Rinpoche there when he was teaching. The book Rays of the Sun (Aro Books worldwide) was created from transcripts of his teachings at Lam Rim in the 1980s. I also met Khandro Déchen there, who became Ngak’chang Rinpoche’s sang-yum and wife, and also my root teacher. Lam Rim is now opening its doors once more to teachers of all traditions, and Ngakma Shé-zér, my vajra sister, will be teaching on yogic song on October 21st. Who knows, perhaps ’ö-Dzin and I will be invited to teach there one day. This would indeed be an extraordinary and inspiring turning of the wheel of Dharma.